APPRENTICES from East Sussex have learned new skills and explored their creative side by staging a theatre show for children. 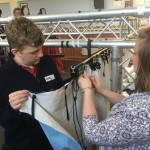 East Sussex County Council teamed up with Making Theatre, Gaining Skills, a company set up to improve the life chances of young people so they gain confidence, consolidate their skills and boost their employability. 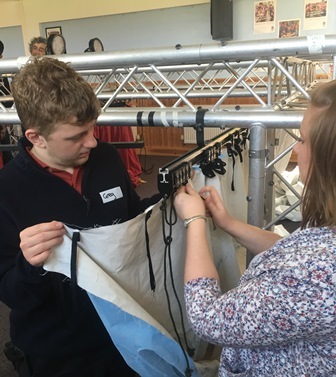 The company led a week-long session which saw 14 of the council’s apprentices write and produce their own play, taking on tasks ranging from scriptwriting and directing to financial management, set-building, marketing and costume-making. The show, entitled Be Careful What You Wish For, tells the story of two young children and their mother who move in with their grandad. It’s not long before they stumble across grandad’s secret in the garden. Fairies reveal themselves and cause mischief, only to realise they need the help of the children to defeat the evil fairies – and all before tea time. The show was performed to an audience of nursery age children as the week culminated in a performance at Seaford Rugby Club on Friday (20). Cllr David Elkin, East Sussex County Council lead member for resources, said: “As a former apprentice myself I know what a beneficial experience it can be to complete an apprenticeship. “Our apprenticeship scheme is aimed at giving young people the chance to gain on-the-job work experience and pick up some valuable skills and qualifications which will help them in their career. “Staging this play has given them the chance to be really creative while learning vital skills such as working as part of a team, communicating and managing a project. The apprenticeship scheme is part of the county council’s employability and skills strategy, which aims to boost economic growth by ensuring people in the county have the skills businesses need. The authority has taken on 56 apprentices over the past year, while its You’re Hired campaign, encouraging businesses to take on apprentices, led to more than 500 new apprenticeships being created across the county. The council is recruiting new apprentices again in July and October. Anyone who would like more details is asked to email apprenticeships@eastsussex.gov.uk or call Rebecca Parsons on 01323 463728. This entry was posted in Business, Children's Services, Economy, Young people on May 26, 2016 by karenb.